This enigmatic country has much to offer those who venture here, including a string of bewitching beaches and awe-inspiring archipelagos on its Indian Ocean coastline. Indeed, Mozambique is the ultimate beach destination with its idyllic white sands, swaying palms, warm turquoise waters, well-preserved corals and pristine dive sites. Add to this its traditions, its cultures and its vibes and you won’t be disappointed. The capital, Maputo, is set in the far south of the country and is easily one of Africa’s most attractive capitals with Mediterranean-style architecture, a waterside setting, wide avenues, shady pavement cafes, colourful markets and a vibrant cultural scene. Within Maputo province is Machangulo, a secluded bay whee fishing, diving, and snorkelling can all be enjoyed. Pemba, in the north of the country, sprawls across a peninsula jutting into the enormous Pemba Bay, one of the world’s largest natural harbours. There are wide sandy beaches and coral reefs which provide safe swimming and snorkelling, while on land the colourful city markets and craft shops are well worth exploring. Pemba is also the gateway to the enchanting Quirimbas Archipelago, comprised of just 32 islands and a marine sanctuary with an abundant array of marine life and rich coral reefs. The archipelago’s natural beauty is astounding, with soft white sands surrounded by brilliant waters alternating with greener, vegetated islands and extensive mangroves. The coastline of the Inhambane province has some of Mozambique’s best snorkelling spots as well as beautiful beaches and secluded coves. In the south, Vilanculos has a collection of lovely beaches and lots of water-based activities. Vilanculos also offers access to the scintillatingly beautiful Bazaruto Archipelago, a series of five islands with stunning beaches and a protected marine reserve that provide the ideal setting for an off-the-beaten-track Robinson Crusoe style holiday. 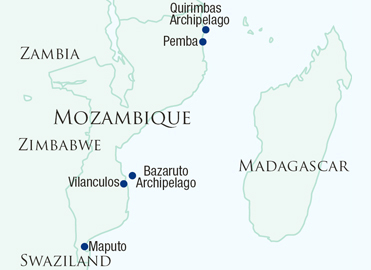 Our vastly experienced travel advisors are passionate about Mozambique. With first-hand knowledge of when and where to go they can create the perfect holiday experience for you, at the best possible price. Flight duration: Most travelers from the UK fly via Johannesburg (approx. 11 hours) and then onwards to Pemba (approx. 3 hours) or Vilanculos (approx. 2 hours 15 minutes). Alternatively, flights from the UK are also available via Nairobi. Best time to travel: Mozambique has a warm tropical climate with a dry season from April-November and wet season from December-March. The dry season is considered the best time to visit with plenty of sun and little rain. However, while the humidity can be high during the wet season the rain tends to be confined to afternoon downpours. Recommended airlines flying non-stop to Maun:South African Airways (via Johannesburg), British Airways (via Johannesburg) and Kenya Airways (via Nairobi). Local time: GMT +2 hours. Language: The official language is Portuguese, however there are around 60 distinct languages and dialects in Mozambique.